Pier-Tech 1 is a stationary fixed height pier that can be designed for either a standing or sitting position or to any custom height that you require. It is a maintenance free all aluminum design, with a 1 inch thick bottom and top plate for exceptional stability. 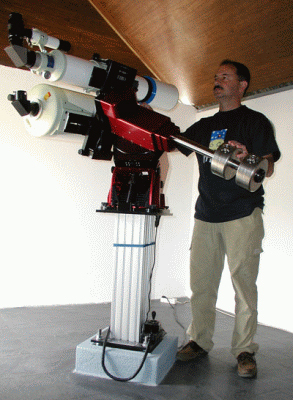 Pier-Tech 2 is a patented electro-mechanical telescope pier. It is designed for the observer who wishes to raise and lower the pier by a push of a button. It can be stopped in any position along its 20″ travel. It comes in both 120 volt and 220 volt (Europe and other countries). it will keep its polar alignment along its entire travel, also keeping your target in the field of view. The PT3 has been re-designed from the ground up to provide even better performance than the previous PT3 version. 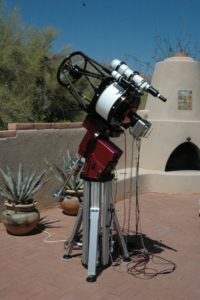 It has double the capacity of the PT2 with the same 20″ precision adjustment. It is better suited for heavy overhung loads. Tri-Pier 1 Portable telescope pier, a powerhouse pier. 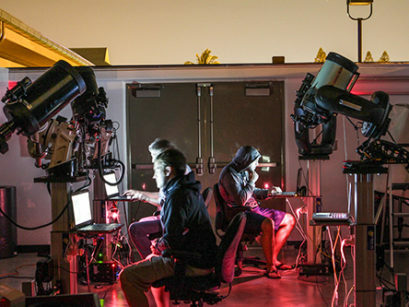 Adaptable to different viewing platforms, both portable and permanent. 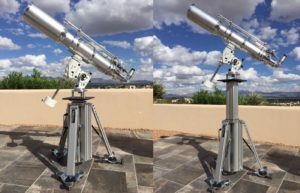 Tri-Pier 2 portable height adjustable telescope pier. 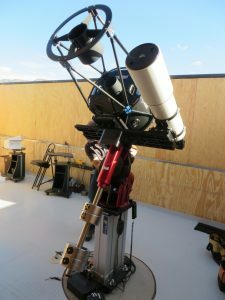 The most versatile telescope pier ever! Built with the same PT2 lifting center pier, with the addition of a surrounding cage that incorporates 3 gas assisted springs that open the legs, making it a solid portable pier that you can move to different locations.